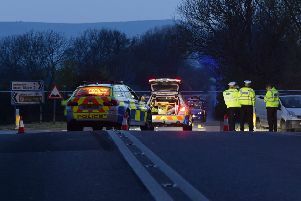 Parents of a boy who ran into the path of a car have shared video footage to highlight the importance of road safety. Please be aware some people may find the contents of the video distressing. Bradley-Joe Chambers, nine, was off to play a game of football on Tuesday evening (October 2) when he ran across Hawthorn Road, Bognor Regis. CCTV footage from a nearby launderette captured Bradley-Joe running in the way of a car and colliding with it, rolling onto the bonnet and then falling onto the road. Dad Marc, 36, said he was clearing the dinner table when he heard the news and said: "A friend's mum came and knocked at the door and I was told he'd been hit. So I legged it round the corner. When I noticed he was standing there my emotions went from being frightened and scared then relief. At that time there were lots of people talking to me. Then my friend came out of the the launderette and showed me the CCTV." Bradley-Joe, Marc and mum Robyn, who live in Essex Road, all sat and watched the footage together. Robyn, 32, said: "I felt sick to my stomach. There's imagining it then there's seeing it. "It's amazing he got up unhurt. It's crazy — I keep reliving it." Marc said: "As soon as I saw it I was upset and angry. I don't want anyone to feel that way. "I just hugged Bradley-Joe. I looked at him and told him he's lucky to be alive — the sun was shining down on him." Marc said Bradley-Joe had broken his elbow weeks before in a Segway accident and said: "If it wasn't for the fact he had the cast on he would have been more hurt." Marc said Bradley-Joe saw a nurse but was lucky to get away with a few bruises. Mum Robyn said her son did suffer some shock and had two days off school. After posting the video, which has been shared on Facebook more than 100 times and viewed by thousands, Marc said: "This video is of my son Bradley-Joe Chambers running into a road without looking and being hit by a car. "I want this video to go viral to show how easy it is and how lucky he was to still be alive." He added: "I'm also very grateful to the driver of the car for actually doing the right speed, any faster I would've lost my boy. If anyone knows the driver please put them in touch with me — I want to thank them for helping him, I've never been so scared in my whole life." Marc and Robyn hope by sharing the dramatic footage, they can raise awareness of the importance of road safety. Marc also called for a zebra crossing to be put in place and said: "20 to 30 kids cross that road everyday."